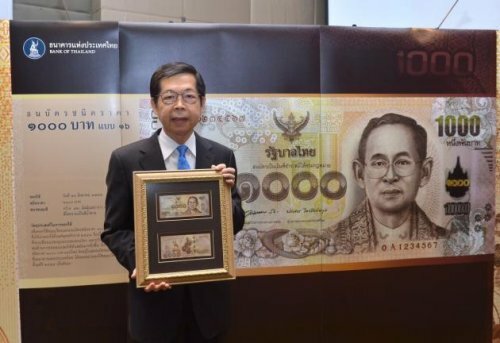 The Bank of Thailand will issue a new 1,000 baht banknote later this week, one that celebrates the many contributions made to the country by King Chulalongkorn, who reigned from 1868-1910. The first 100 million of the new banknotes will be put into circulation on Friday, central bank governor Prasarn Trairatvorakul said on Monday. The new note will eventually replace the current note, which has been in circulation for 10 years. Ms Prasarn said the old design would also remain in use for now. The central bank believed it would take up to two years to completely replace the old 1,000 baht note with the new banknote. The new banknote has been enhanced with new security features to deter counterfeiting and facilitate authentication by machine and the public, including the visually impaired. Rama V is venerated for the many significant reforms he introduced, including ending slavery in Thailand. The first related law was announced on Aug 21, 1874, setting a value for slaves who wanted to buy their freedom and prohibiting the purchase of people older than 20 as slaves. This set the scene for abolishing slavery completely in 1905. In recognition of this, the new banknote is being put into circulation on Aug 21.